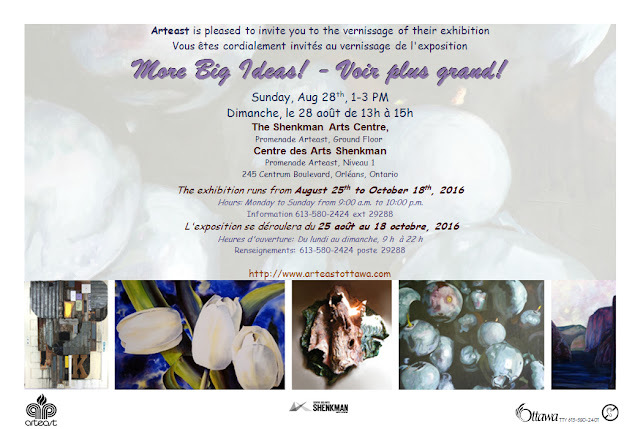 The public is invited to an opening reception for More Big Ideas – Voir plus grand! – the latest show to be presented by Arteast. The reception will take place on Sunday, August 28th from 1:00 p.m. to 3:00 p.m. on the ground floor of the Shenkman Arts Centre, 245 Centrum Boulevard, Orleans. The 11 works of art in this exhibition showcase the varied media that Arteast members employ and are representative of the high quality of work produced by its membership. The artists have unleashed their creativity and imagination on large supports, presenting the viewer with bold and dynamic perspectives. Le public est invité au vernissage de l’exposition «Voir plus grand! » présenté par les membres d’Arteast. La réception aura lieu le dimanche 28 août 2016, de 13h à 15h au niveau 1 du Centre des Arts Shenkman, 245 Boulevard Centrum, à Orléans. Les 11 œuvres d’art de cette exposition représentent une grande variété de médium que les membres d’Arteast utilisent. Les artistes ont exprimés leur créativité et imagination sur des grands formats libérant ainsi une perspective dynamique. On Tuesday, September 6, 2016, please retrieve the works that are currently hanging and/or bring in new paintings (or other two-dimensional art) to the Orleans Library. These new pieces will be hung until Tuesday, November 1, 2016 . The changeover at the Orleans Library is between 10:30 a.m. and 11:30 a.m.
We look forward to seeing exhibitors on Tuesday September 6, 2016, at 10:30 a.m.
Arteast is taking steps to hire its first employee—a part-time Administrative Assistant. In addition to needing volunteers to run our exhibitions and programs, Arteast needs an employee to help the Treasurer and some of the Coordinators with certain tasks. Thanks to an operating grant for 2016 from the City of Ottawa, Arteast is now in a position to hire someone. I must emphasize, however, that Arteast will continue to need the help of volunteers in all areas of activity. So please don't hesitate to step forward to help. The Administrative Assistant position will, of course, be open to all members of Arteast. However, it will also be open to non-members and steps are being taken to advertise this opportunity at large. So, if any of you are interested in becoming Arteast's first employee, we welcome your application. Details are in the job posting below. The deadline is 15 September 2016. Arteast is a highly active, not-for-profit ,visual arts organization in Eastern Ontario. Its aims are to provide an organization through which members may develop their abilities and interests in the visual arts, foster the growth of visual arts, and contribute to the cultural development in Ottawa and surrounding regions. - mail out Arteast's hard-copy publications: Communiqué (three times a year) and the Grow With Art brochure (once a year). - providing administrative services to managers or senior officials. - bookkeeping practices and principles of budget tracking. - to communicate effectively orally and in writing in English and French. - Personal suitability: - Effective interpersonal relationships; initiative; discretion; and, judgement. - Using Quikbooks accounting software would be an asset but is not essential. To obtain further information about Arteast, please visit www.arteastottawa.com. To apply, please send your résumé and covering letter by e-mail to president@arteastottawa.com or by mail to Arteast, Box 5, 245 Centrum Blvd., Orleans, ON, K1E 0A1 - Attention: Lynne Alsford, President. - poster la copie papier des publications de Arteast: le Communiqué (trois fois par an) et la brochure Grow With Art (une fois par an). - pratique comptable et principes budgétaires. - Personnalité - Relations interpersonnelles efficaces; initiative; discrétion; et jugement. - l'utilisation du logiciel de comptabilité Quikbooks serait un atout mais n'est pas essentiel. Pour tout renseignement complémentaire sur Arteast, veuillez visiter le site www.arteastottawa.com. Pour répondre à l'offre d'emploi, veuillez envoyer votre CV ainsi qu'une lettre de présentation par courriel à president@arteastottawa.com ou par courrier ordinaire à Arteast, CP 5 245 Blvd Centrum, Orleans, ON, K1E 0A1 - À l'attention de Lynne Alsford, Présidente. Date limite : 15 septembre 2016.
four “Cartooning and Comics” workshops/courses for children. They will differ depending on the likes of the students. “Painting Like Famous Artists - Adults” at François Dupuis Recreation Centre has the following description online: Mixed Media –The Basics. In the printed François Dupuis version you find the same courses under Acrylic Painting Workshops. Create a painting using the techniques of famous artists. Join us on the third Tuesday of every month for a 2 ½ hour workshop. Each workshop will feature a different artist. Choose the ones that interest you the most and register ahead of time. Art instructor will contact participants with a supply list (approximately $20.00).